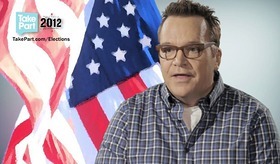 If he were President of the United States, comedian Tom Arnold says the first thing he’d do is head down Pennsylvania Avenue to meet with members of Congress. And then he’d point out just how much the rest of the country absolutely hates Washington D.C. these days. Arnold spoke to TakePart as the kickoff entertainer in their 2012 “Why I Vote” video series featuring celebs talking about the issues that are motivating them to head to the polls this election series. Check out the full video here, and look for future episodes featuring celebrity fitness expert Jillian Michaels, MTV star Ashley Rickards, and many more. And for the latest election news about issues that really matter — like education, the environment and social justice — check out TakePart’s elections hub page at TakePart.com/Elections.